2 things I love are now combined into one! I love Super Mario Bros. I love cake. 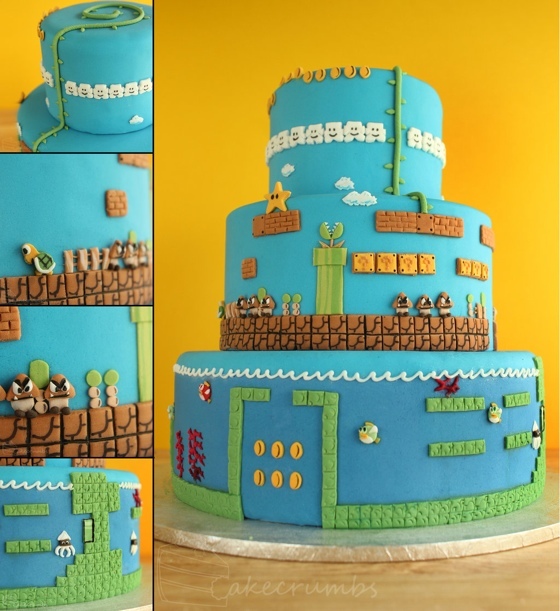 And I absolutely love this Super Mario cake! I can’t believe how much time and effort it took CakeCrumbs to make this amazing thing. 5 days, and everything is hand cut out of either Marzipan or Fondant. The levels are even an accurate representation of levels 2.1 and 2.2 of the original Super Mario Bros. How crazy is that? The cake aims to be a level-accurate depiction of levels 2.1 and 2.2. I chose those levels as it allowed me the variety to depict three different ‘places’ on tiers that could be joined relative to one another. I picked level 2 as I originally thought I could fit the whole level on the cake, but as I began I realised even these beginning levels were too long. The cake took about 5 days to finish. There was a lot more detail than I expected. Everything from the stripes on the pipes to the embossing of the stones took a lot of time. Everything is hand cut, mostly with a craft knife, and either embossed or painted (with edible ink) to add the details. It’s all fondant or marzipan, save for the coral and the waves, which are piped from royal icing. The pressure point on this one was how small everything necessarily became. The enemies are all less than a centimetre tall. The teeth on the goombas and piranha plants are less than a mm long. I’ve never worked on such a minute scale before. It was definitely a challenge, but has given me lots of confidence in attacking this sort of thing in future. Usually I’d omit teeny details because they were ‘too small to be done’. Now I know it’s possible with a steady hand, patience, and a hellovalot of time.